Works with AixiZ and other standard laser diodes. •	Adjustable constant current (ACC) driver •	80-500 output current range (adjusted by pot on the board) •	5-10V input •	TTL control (if required) •	Ideal for laser modules (for battery powered hosts this driver requires the diode to be electrically isolated if the diode if the diode is case+ve) Compact, production quality board. This is a low drop out voltage linear current regulator. The Laser Diode +ve is connected to Power +ve and Laser Diode –ve is controlled by the circuit. (Note: for case +ve diodes the case cannot be grounded.) The minimum input voltage depends on the laser diode operating voltage and current setting, it is typically about 0.5 – 1.5 V higher than the laser operating voltage. Lower voltages will not allow the full current range and higher voltages will be dissipated by the driver as heat. (Max.~10V) The current required by the driver is typically 20-30mA higher than the output current. Stability is typically better than 3%. 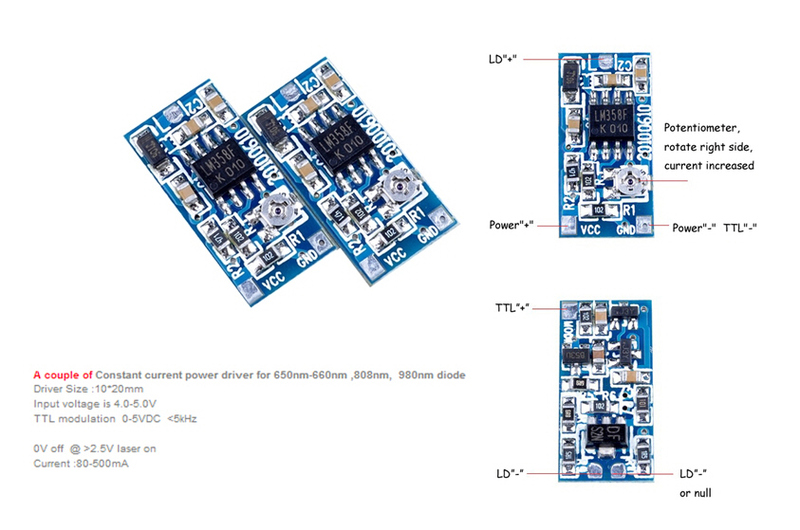 When the TTL +ve is not connected the output is a few mA, when it is powered above 2.5V the driver is enabled; it can be connected to power +ve for continuous operation. The TTL control can be used to switch the laser at rates up to 10kHz. Board color (the printed solder-resist layer) may be green or red depending on production batch.